Legal category of drug: POM-V. This means that it may only be prescribed by a vet for an animal under his or her care (ie the vet must have seen the pet within a reasonable period of time). Licensing situation: This drug is not licensed for the rabbit. 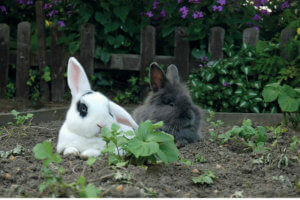 It is used widely in rabbits, however, based on lots of anecdotal data, and in the absence of a licensed product it can be used under the Cascade legislation. No drug is 100% safe, and you and your vet should discuss dosing, possible risks and benefits at the time. Formulations: There is a suspension for cats and a more concentrated one for dogs, as well as tablets, injections and sprays. The spray hasn’t been used much with rabbits, and tablets, whilst they can be used in rabbits, are more difficult to give than a liquid It is probably because of the tasty liquid formulation that this drug has been used so widely in rabbits. As a very gnereal rule, the cat suspension is not concentrated enough for any but the smallest rabbits, so the dog one is usually used. Uses: Meloxicam is a non steroidal anti-inflammatory drug (NSAID), which reduces pain due to its anti-inflammatory effects. It is widely used both short term, eg after surgery, and long term, eg for arthritis etc. Risks and concerns: Liver disease can lead to reduced metabolism of the drug, and it can build up to dangerous levels as a result. Dehydrated or shocked animals, or those with other reasons for reduced blood flow to the kidneys, can suffer kidney damage with drugs of this class. It’s therefore important to make sure rabbits are hydrated during treatment, and vets may opt to give it at the end of surgery when normal blood pressure is restored. Durgs of this class can also cause gastrointestinal bleeding. It’s unclear how much of a concern this is in rabbits as they do not vomit, and blood is difficult to see in the faeces, but this concern should be borne in mind. Very importantly, it should not be given with other anti-inflammatory drugs or steroids. Small mammals: Rabbits: 0.3 – 0.6mg/kg subcutaneously (underneath the skin) or by mouth every 24 hours; (this equates to 0.2 – 0.4ml/kg ie millilitres of liquid per kilogram of your rabbit’s bodyweight, if using the dog liquid.) Studies have shown that rabbits may require a dose exceeding 0.3mg/kg every 24 hours to achieve optimal plasma levels of Meloxicam over a 24-hour interval. Doses of 1.5mg/kg per day (1ml per kilo of the dog liquid) subcutaneiously or by mouth were well tolerated in healthy rabbits in good hydration for 5 days. Do not alter the dosage that your vet has prescribed without discussing this with your vet first.